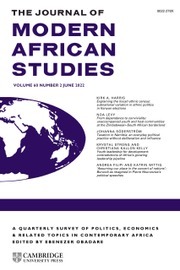 The editors of the Journal of Modern African Studies are proud to announce the David and Helen Kimble Prize, to be awarded annually to the author(s) of the best academic article published in the journal in the previous calendar year. The prize will be adjudicated by the editors of the Journal of Modern African Studies. The prize is named in honour David and Helen Kimble who co-founded the journal in 1963. David, who went on to edit the journal for 35 years, passed away in 2009; Helen, who is now in her nineties, still takes an active interest in African affairs. We are delighted to announce that the winner for 2018 is Kingsley L. Madueke, for his article Routing ethnic violence in a divided city: walking in the footsteps of armed mobs in Jos, Nigeria, vol. 56, issue 3. This is a well-written article which draws on extensive fieldwork and provides a detailed explanation of how violence erupts and spreads in a Nigerian context. It has both academic and policy implications, and the depth of the research gives it critical leverage in throwing a penetrating light on an important subject. To see the full announcement, please click here.